2000/01 Rob Reynolds Peter Dally Phil Darling John Crawford ? Click on the Year to view more history per century. Early that year, Togo invited a small group, including Griffin, to his home in Mosman, where the formation of a club was proposed. 1976 saw the inaugural Sydney-Suva Yacht Race started by the Governor General of the Day, Sir John Kerr. 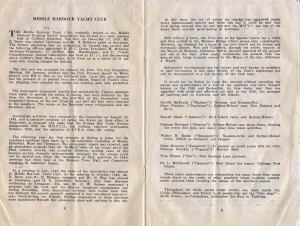 It was also mentioned in the Rear Commodore's report around this time that MHYC was conducting races on 170 days per year for over 200 entrants surpassing any other yacht club in Australia. The success of club members and their yachts during this period was legendary. 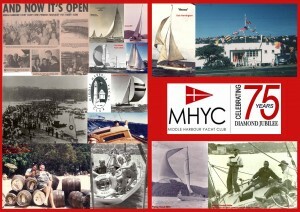 It would be impossible here to list all the racing successes but in summary, MHYC representatives won practically everything on water including the Sydney to Mooloolaba Race, Brisbane to Gladstone Race, Dunhill Half Ton Cup, Ampol Tasman Trophy, South Solitary Island Race plus numerous State, National and World titles. In 1983, MHYC was the first club to welcome back the victorious Australia II crew, including club member Hugh Treharne, after they won the America's Cup. 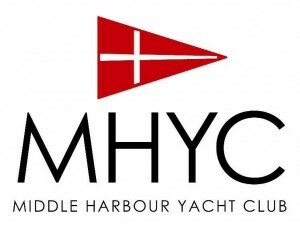 MHYC is the scene of year round sailing activity. The club boasts a comprehensive calendar of events that sees action on and off the water taking place virtually every day and evening of the year. This broad spectrum of events and activities offers participants at all levels and in all aspects of our sport the opportunity to experience and enjoy the many rewards sailing has to offer cradled in a unique atmosphere of spirit and camaraderie. 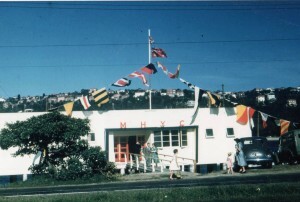 THE Middle Harbour Yacht Club, originally known as the Middle Harbour Cruising Yachts' Association, was formed at a small meeting held at Griffin's Boatshed, The Spit, on December 13, 1939. Mr. R. Down was elected Chairman and Mr. H. Middows acted as Secretary. The formal resolution that an Association be formed was carried and the following officers appointed: R. H. C. Down, President; H. Middows, Secretary-Treasurer; G. Griffin, Hon. Handicapper, and C. Powell, Committeeman. Annual subscription was fixed at £1/1/-, and the meeting place, Griffin's Boat Shed, rooms to be fixed up at a rental of £1 per week with varying charges for lockers. The first race was arranged for January 20, 1940. The first Committee Meeting, 9th January, decided that the Club Pennant should be White ground with MH in Red on the left-hand side. Later this was changed and the pennant in its present form was chosen. Board of Trade's rules for shipping were adopted for racing and working sails only permitted. The Association progressed quickly and satisfactorily. Various attempts were made to provide for extras in racing, but were deferred for the time. On November 3, 1941, the activities of the Association were suspended because of the war situation and half the fees were remitted to the members. The rooms at the Boatshed were relinquished and the furniture stored. Association activities were resumed by the Committee on August 23, 1944, and a tentative program of racing was drawn up. Soon after, in September, a proposal was made that the Broken Bay Yacht Owners amalgamate with the M.H.Y.C.A., but nothing concrete eventuated. October, 1945, saw the adoption of S.Y.R.A. rules for racing. The following year the first attempts at finding a home for the members meetings were made by a sub-committee consisting of Messrs. Elderfield, Ward and Thompson. The subsequent report was rejected, and an alternative proposal that Mr. Griffin's offer of his rooms above the Shed, suitably altered, was accepted. However, nothing came of this because certain domestic arrangements necessary for the change could not be carried out. Since the resumption of Club activities in 1944, meetings had been held at the Mosman Town Hall, and Committee meetings in members' homes. 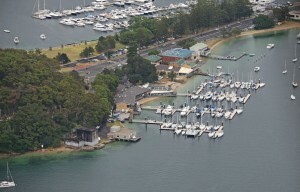 At a meeting in July, 1946, the name of the Association was altered to Middle Harbour Yacht Club. At the meeting in October, 1946, Mr. R. Down and Mr. H. Middows resigned, and Mr. N. Way was elected as Chairman, and H. S. Elderfield, Secretary, with John Shannon continuing as Treasurer. The late Mr. C. W. Robson sponsored a proposal that the Club and the Sydney Amateurs amalgamate and during November, 1946, discussions between both bodies were held, but although the utmost goodwill prevailed it was considered impracticable. Nevertheless, the friendly feelings engendered at those meetings were maintained through the subsequent years and continue to this day. At this time, the use of extras for racing was approved under strict measurement control and from this day it could be said that Club racing entered into its own and now the M.H.Y.C. has one of the finest fleets actively participating in Australia. Still without a home, the Club met at the Spastic Centre for a while and then settled in the Mosman Bridge Club's rooms; very comfortably. However, the demand for a home of our own would not be denied and eventually Messrs. Way and Elderfield, through the active support of the Mayor of Mosman, Alderman Ferris, secured approval of the project and site at the Spit. After many vicissitudes the present Club was entered into, being formally opened by the Mayor of the day, Alderman J. Warre.